According to the report, the renowned player, who scored an impressive hat trick against Spain on Friday, will move to Old Trafford-based Man United once the tournament is over. However, the French club Paris Saint-Germain (PSG) is currently competing with the British club for Ronaldo, the report says. The rumors about the forward leaving the Spanish club emerged right after the end of Champions League. 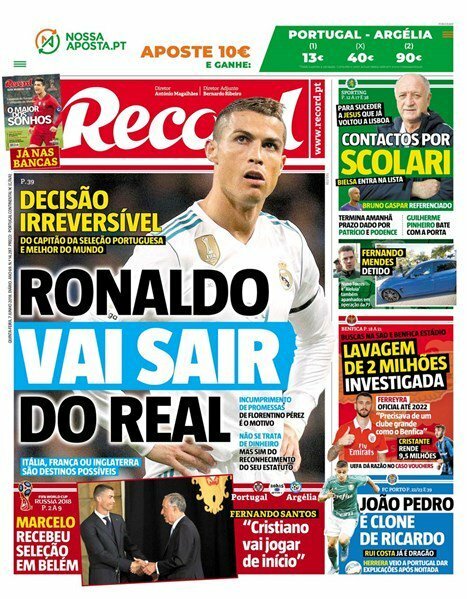 On June 6, Spanish paper El Confidencial announced Ronaldo’s plans to leave the team, which was followed by an edition of the Record next day that had “Ronaldo Is Leaving Real” all across the front page of its paper. ​Record reported at the time that Ronaldo had made an “irreversible” decision to leave the club. Apparently, it was the club’s reluctance to raise the forward’s payroll to match that of Lionel Messi’s 55 million euros per season that caused the split. Florentino Perez, Real Madrid’s president, reportedly told Ronaldo and his agent Jorge Mendes that the club would be increasing the player’s payroll, but it has failed to live up to the promise. Currently, Ronaldo earns 21 million euros per season, according to 101GreatGoals.com. Spanish sports website Diario Gol, however, also reported Monday that Ronaldo wants the club to sell four players in order to get him to stay in Madrid. According to Diario Gol, Ronaldo insists that Real Madrid cut lose Gareth Bale, Theo Hernandez, Mateo Kovacic and Francisco Román Alarcón Suárez, better known as “Isco.” Ronaldo is backed in this demand by Real Madrid’s head coach, Julen Lopetegui. Meanwhile, speaking earlier this month, former Real coach Fabio Capello claimed Ronaldo was hellbent on returning to United, according to the Express.